Pogba: next Man Utd captain? Man Utd's management team are considering making Paul Pogba the new club captain in an effort to help keep the World Cup winning Frenchman at the club. The interest of Real Madrid has unsettled Pogba, and the midfielder is rumoured to be in line to receive the armband from next season. 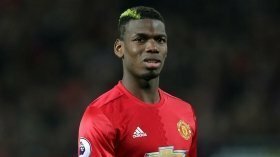 Pogba, who was on target twice during Saturday's 2-1 win over West Ham at Old Trafford, has long been linked with a move away from United, but has so far stayed loyal to the club that he joined from Juventus just two and a half years ago. It seems that manager Ole Gunnar Solskjaer is ready to make Pogba the club captain in an effort to persuade the 26-year-old that his long-term future should remain with Man Utd. Pogba, who has two and a half years remaining on his current deal, is said to be open to agreeing new terms and a fresh contract but requires certain clauses included in his next contract. It is understood that one of them would allow him to leave for a bigger club.